To date the Shoprite Group has purchased over 20 million cartons of apples and pears for its Shoprite and Checkers customers in 2689 outlets throughout 15 African countries and the Indian Ocean Islands from Tru-Cape Fruit Marketing, which exports fruit to over 104 countries. To date the Shoprite Group has purchased over 20 million cartons of apples and pears for its Shoprite and Checkers customers in 2689 outlets in 15 African countries and the Indian Ocean Islands from Tru-Cape Fruit Marketing, which exports fruit to over 104 countries. In 2010, Tru-Cape marked the delivery of its 10 millionth carton of fruit to the Shoprite Group’s fruit and vegetable procurement arm Freshmark and, at the time, both parties hoped for mutual continued success. Today, less than seven years later, growth in the fruit and vegetable category as well as Tru-Cape’s increased ability to source apples and pears from different climatic regions along with Tru-Cape’s Gauteng-based storage and distribution facility, means increased capacity and reach. 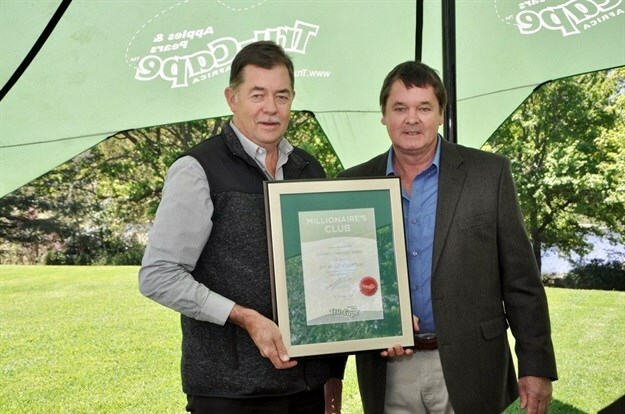 Tru-Cape MD Roelf Pienaar said that Tru-Cape has worked hard to improve its efficiencies, which is evidenced as having been selected as 'Supplier of the Year' to the Shoprite Group in 2015, with two of its growers recognised as 'Farmer of the Year' and 'Emerging Farmer of the Year'. “As a wholly grower owned business, our integrated approach to owning and managing the value chain has proven beneficial for our growers and suppliers alike. Despite our leading position we continue to search for ways to do what we do better with ongoing attention to our quality, people and processes," says Pienaar. Dr Johan van Deventer, MD of Freshmark, adds that this focus has resulted in quality produce delivered on-demand, which has meant that Shoprite Group customers have uninterrupted supply of quality fruit every day of the year. “As we mark the purchase of the 20 millionth carton of fruit from Tru-Cape for our customers in Africa, South Africa and elsewhere in the world, we look ahead to a continued relationship that will grow even further to benefit Shoprite and Checkers customers, the growers and Tru-Cape going forward,” Van Deventer says. Freshmark MD Dr Johan van Deventer with Tru-Cape director and grower Derek Corder. Tru-Cape’s growers in the Elgin, Grabouw, Villiersdorp and Vyeboom valleys, the greater Ceres region and in the Langkloof, near the Garden Route, along with its grower-owned processing, packing and storage facilities Two-a-Day and Ceres Fruit Growers, means that based on trees on the ground at the moment, the company will have to be able to manage more than 50% more fruit in the next five years. “We look forward to a further strengthening of our ties with Freshmark to deliver these to the African continent and beyond,” concludes Pienaar.